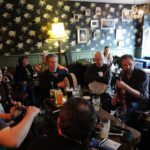 So we know that we’re going to meet Seamus, Rodney, Dave and Seamus’ lovely partner Camille in Sligo for a late afternoon session at McGarrigle’s Pub. Beyond that we’re a little hazy. We’re thinking that perhaps we should at least check in on the session at Liam Cryon’s in Carrick, but we’re learning that the best laid plans are kinda futile. 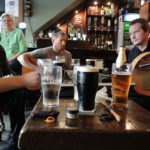 We meet Seamus and crew, settle in at a large table, get pints and get to it. We have so many tunes in common that it’s very easy to slide into a nice groove. Luckily Rodney and Dave are in a song mood and play some great ones. 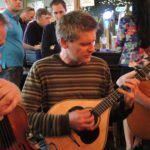 Rodney has learned how to accompany his song with bouzouki somewhat in the same manner as Andy Irvine. He studied with Andy a couple of times and told us that Andy is so deep in the subject and has such a knowledge base that Rodney couldn’t absorb much of what Andy was showing him. Despite what he says he has absorbed some of it, because he plays these counterpoint lines through the vocals and it’s beautiful and feckin’ difficult to do. Dave on the other hand plays great guitar, much different than me and I got a lot of ideas watching him. He’s absorbed some of what John Doyle does, but has made it his own and has a nice way of emphasizing the lyric of the song with beautifully turned descending or ascending chord changes that play across the vocal. Playing music with these men is such a pleasure that I really don’t want it to end. So despite our intention to check out the Carrick session we’re all hungry after three hours of tunes, so off we go to a restaurant that Seamus and Camille know about. When we’re finished with dinner it’s 10:00 and too late to get to Carrick but not too late to walk down the street to Foley’s for another session. Many were back that we saw the night before and were very welcoming. So don’t make plans in Ireland. Forget the plans it’s all a waste of time. It’s much easier and a lot more fun to swim with the current and see where it takes you. The first night at Foley’s was packed, all of us players wedged into a corner of the pub but tonight, ah yes tonight we’ve even more of us wedged into the corner. Young Patrick is back with his parents and he grabbed a stool early so he can be closer to the action. Patrick is learning fast, you stake out your spot and hold it. Dave and I sit next to one another so we can listen to what we’re doing. The two of us spent the first night sizing each other up. It’s inevitable that two players of the same instrument are going to take measure of the other, it didn’t feel competitive but you want to see what the other one’s got and what he’s going to deliver. Tonight though we’ve absorbed a little of what the other plays and we’re locked in. We get a mighty groove going on some of the sets and have the bottom locked down solid. Kevin is grooving on bodhran and it’s a mighty rhythm section rocking Foley’s. 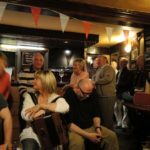 We had great fun, Seamus and Rodney, Morgan, Don and James spinning out the tunes and the rhythm section pushing it forward. Great craic, and it wasn’t really part of the plan. So again forget about the feckin’ plans. It’s a fool who thinks he can plan a night in Sligo or anywhere in Ireland. About 12:30 we took our leave we were all tired and Don was the D.D. and it’s a good 30 min. back to Drumshanbo. 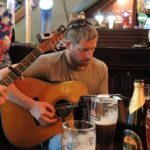 We shake hands, get hugs and talk about a session at Shoot The Crows Pub in Sligo, but we didn’t go as far as making a plan. We all know that’s worthless. That was all last night. Today, Monday morning, we decided we needed to do a bit of touristing. 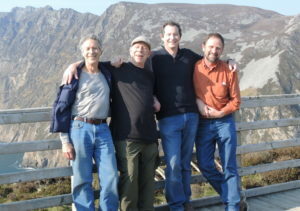 We wanted to go north into Donegal and looked at the map and thought that Sliabh League would be a nice goal. They are huge cliffs that drop into the sea on the edge of Donegal. The highest point to the ocean is 1972′, that’s right! close to two thousand feet down to the ocean. Quite a drop. We meander up through back roads into some spectacularly rugged and beautiful country. From rolling emerald green fields dotted with sheep to rugged hills, into a spectacular valley with eroded mesas similar at times to the Columbia Gorge and out to the ocean. We stop in a lovely little village named Kilcar that had a woolen mill. Everything in it is hand woven on looms upstairs from the showroom. Don found a vest and I found a hat that I really like and then we pushed on up an increasingly tiny road that started out vaguely two lane and became closer to one lane, and then closer to half a lane. Meeting another car is always a bit hair raising and I’m glad that James was driving. He grew up driving on the left side and it’s second nature to him. We arrive at a lot at the top of a steep incline and walk the rest of the distance to the cliffs. They are spectacular but not quite as beautiful as the Cliffs of Moher, which aren’t as high. We looked around for awhile and headed back down. 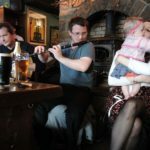 Went back into Kilcar looking for a bite to eat and scouting out a pub that might have music. Nothing happening there so back to Kenkille where we grab a pint at a Hotel restaurant that’s understaffed, has poor service and high prices. It’s supposed to have wifi but that doesn’t work well either and when I frustratedly go to close up my iPad manage to knock over my pint all over the table and some into Don’s lap! I feel a fool, get towels from the barman and clean up the mess. Don takes it well, but it’s hard for me to let it go. Haste makes waste. So we find a smaller place get fish and chips and head toward Donegal city. We arrive there about 8:30 spot a pub that advertised a session. It’s called the Reel Inn and the walls are covered with photos of famous musicians. 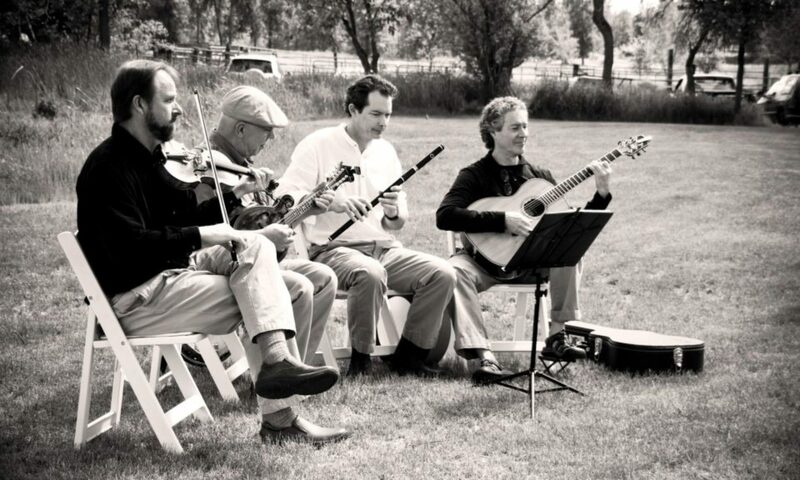 One big B&W photo has a young Joe Burke ( box ) Charlie Lennon ( fiddle ) and what appears to be a young Liam O’Flynn on pipes. A pantheon of iconic players. We’re assured by the barmaids that the session is open and we’d be most welcome to join. About 20 min. 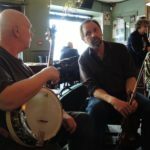 later Seamus and his playing partner John show up and we sit down and start tunes. Soon the place is full of what we find out are German tourists and some locals and the joint is jumping. We play until about. James and I are out back on smoke break and meet a fellow from Newry north of Belfast who plays flute and whistles urge him to grab his kit and he comes back. His fiancee also sings and the session turns out to be a lot of fun. Seamus asks if he can record us and we tell him no problem and let him know we’ve been doing the same at all the places we’ve gone to. We play until 11:00 or so and bid everyone goodbye and drive back to Drumshanbo. Not a bad day with minimum plans. We met Seamus in the small town of Ballisodare near 10:00 pm. 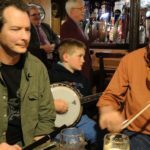 Tunes don’t get going until late in the evening and that’s everywhere in Ireland. The fun starts late and ends late. Once you’re in the flow it feels no different than starting at 6:00 or 8:00, it’s just the way of it. We followed him and his girlfriend into Sligo and parked. As soon as we got out of the cars Seamus says that he wants to apologize for this pub, that it’s not always the best musical venue and the patrons aren’t always the best listeners, so he’s just warning us up front. We assured him that the whole experience is what we’re after and we can take it in stride; not to worry. So we walked around the corner and across the street to a roaring little pub, Foley’s, and crowded into a corner. This for me is the quintessential local Irish pub. It feels welcoming, a little dog eared, and friendly. 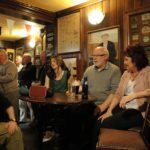 This is where people meet and share stories and song, banter, joke and tell tall stories. 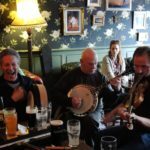 Seamus introduced us to his mate Dave who plays guitar and we settled in, bought a round of pints and took stock of the scene. As we were unpacking instruments I looked over to see Seamus’ other musical partner Rodney. 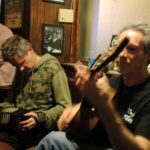 It turns out that Rodney plays concertina and bouzouki, his concertina was the first one I’ve seen pulled out at a session this trip and we were glad he did. He plays it beautifully and there was hardly a tune that was started that he couldn’t play and play it nicely. He’s a very solid player. If I got off track because of the noise I’d come back to Rodney. He kindly called out the keys on anything he thought we might not know. 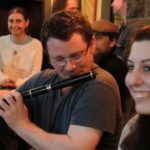 He’s also a very fine singer and delivered Paddy’s Lamentation with real pathos while accompanying himself on concertina. I love the song and he leaned over to tell me “no offense”. I told him none taken, that I loved the song. For those reading that don’t know the song it’s a Civil War era tune written from the viewpoint of an Irish immigrant who gets swept up into the American Civil War, and told to fight for Lincoln and loses a leg for his trouble. He’s longing to return home and has seen enough war and trouble. Rodney did it as well as I’ve ever heard it done. Dave plays fine guitar. He uses drop D tuning which is the other tuning aside from that which I play, DADGAD that’s used in Irish Trad. John Doyle excels at the drop D which only lowers the low E string to D. I like it fine but found the left hand stretches just too much. It made my hand hurt, but Dave uses it well. He also has a lot of fine songs that he sings very nicely and I enjoyed listening to. Now to Seamus. He is an outstanding flute and whistle player. His father is P.J. Hernon and uncle is Marcus. He plays with that big, bold sound that cuts across the session. He has a command that only comes with decades of playing. 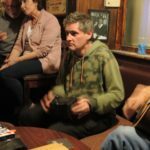 I don’t know Seamus’ age but I’m guessing mid 30’s and he told me he’s been playing this session since he was 15. There are many sessions he plays, but this particular one he’s attended all that time. He, Dave and Rodney played some mighty sets that spanned 6 or more tunes and Seamus played utterly relaxed without a sign of strain or need for breath. It was fun being part of it and looking at the faces of the patrons who were really engaged in the music; impressed that some Yanks were sitting in and keeping up. As the night gathered speed so did the session. I looked up to see a very young fellow sit behind James and Morgan holding a banjo. His name is Patrick and he’s 11 years old. Rodney asked him to start a tune and by God he played really well. Here is a huge distinction between the USA and Ireland. Patrick is shouldered up with the rest of us, his drink of choice is lemonade and he’s absorbing the tunes and atmosphere and playing his instrument. I didn’t see his soul being stained, or his trying to sneak a drink or being anything other than an 11 year old boy who loves the music. It was touching to see. His parents were over in a corner listening, proud of their young boy, as they should be. There was also a young girl sitting in one corner, about the same age, who was really engaged in the music as well. He started quite a few tunes and was a patron favorite as well as with us. At one point a man I’ll name Michael (I think that was his name) led a song The Rattling Bog. It’s one of those songs where you keep adding the subject of the previous verse to the current one and it gets longer and longer. Michael was hilarious and enthusiastic and we were all laughing. We were out on the sidewalk having a break and Seamus asked what we were doing tomorrow. This is always a good sign, it could just as easily be, ” it was nice meeting you, have a fun rest of your vacation “. 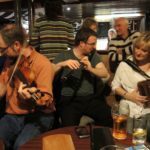 James mentioned that we were looking at a session at Carrick on Shannon at Liam Cryon’s and both Seamus and Rodney said , no, no, no you must come to our session tomorrow afternoon. Seamus said, ” look, I don’t want to say that you won’t have a good session there, there’s a fine box player, but the craic will be better here”. Now a short exposition on CRAIC. Craic is one of those terms that has many meanings. It can mean great atmosphere, great music, great banter, great fun, great jokes, great interaction, but it alway implies great fun and feeling. Despite the warning the session was great, and Seamus told me it was because we were part of it and offered the patrons a very different experience, that they were so used to what the three of them usually offered. As we were leaving various patrons were clapping us on the shoulder and shaking our hands and saying, “See you tomorrow”, So we’re off to an early session with Seamus and the lads at a different pub at 5:00 (early) and then if we wish back to Foley’s for another. Here we go, hold onto your hats and button your coats; we’re off to more good craic!